It's too bad that nobody grabbed some of Milton Humason's empty liquor bottles that he tossed in the brush behind Mt. 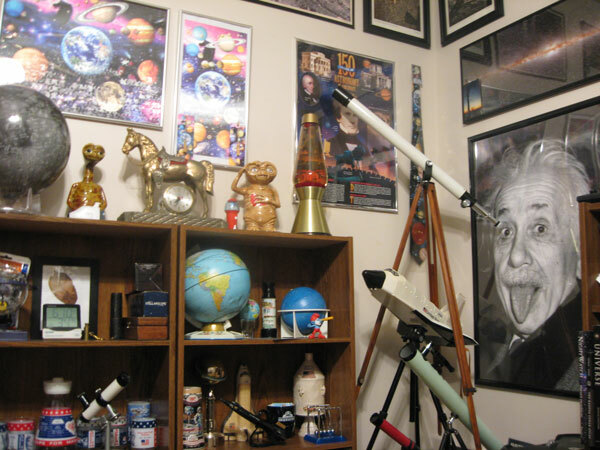 Wilson observatory. One of those would be a cool artifact for display. I do have one of Tom Cave's empty breakfast cereal boxes (no lie!). I've been wating for Turk to make me a ridiculous offer for it. 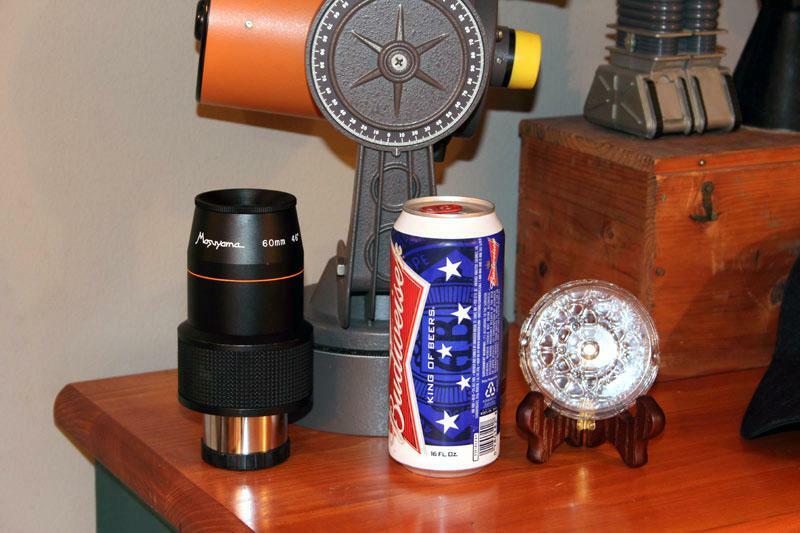 Speaking of Milton Humason's empty liquor bottles, here`s my ash tray next to a 16 oz Budweiser. It's wrapped in brown paper, with one of Cave's return address labels on it. It has "F.R.A.S." hand-written on it after his name. I bought a book from him a long time ago, that he had listed in the Starry Messenger and he sent it in the cereal box. For some reason, I've hung onto the box all these years. Yep, that's easily a 16 oz. eyepiece! Its a very rare eyepiece and the crown jewel of my Masuyama lineup. I found an old Edmund "jumping disk" still in plastic sleeve. Compared to that Masuyama EP, though, it's about as interesting as watching something rust. When I saw the first photo, I was thinking "OK, Robby is good, but where's B-9?" Then you totally came through! I have the Johnny Lightning Lost in Space set. If I could talk myself into removing them from the packages, they'd make nice display pieces next to the ashtrays. My B9.. the regular one is behind the chrome one. I had forgotten about those. I have the ST set as well as TLOTR set. And I found some Star Trek stuff in that closet too. Phaser, communicator, tricorder (original series) as well as the ST watch (analog). The second-hand is a little Enterprise that flies around the watch dial. All the ST stuff is still in it's original packaging. I'll tell you one thing Kirk would have never stood for A Pimply little Ensign talking back to him! And you don't get up from a Capn' Kirk Karate Chop! 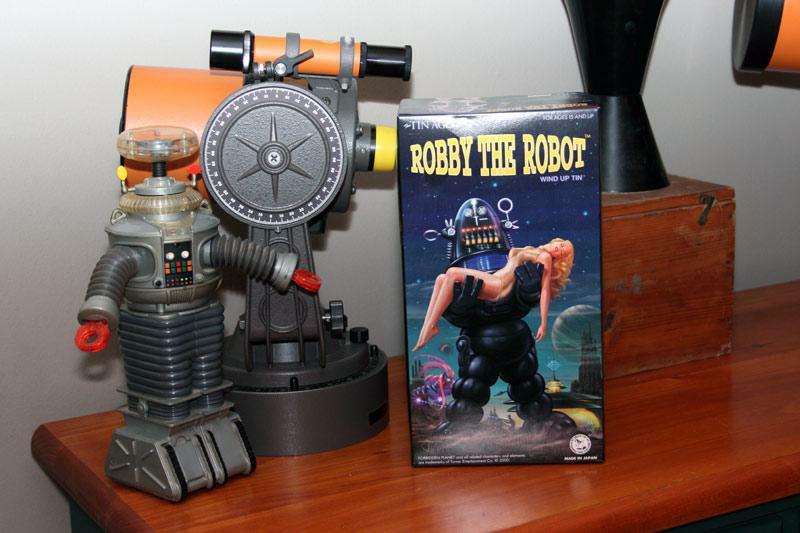 Robby robot box, also have the Movie Forbidden Planet on Blu ray. Plasma disc, to right of flat screen, forget the exact name for it. Its still a work in progress, but its getting there. I hung this in the living room when my ex-wife left. 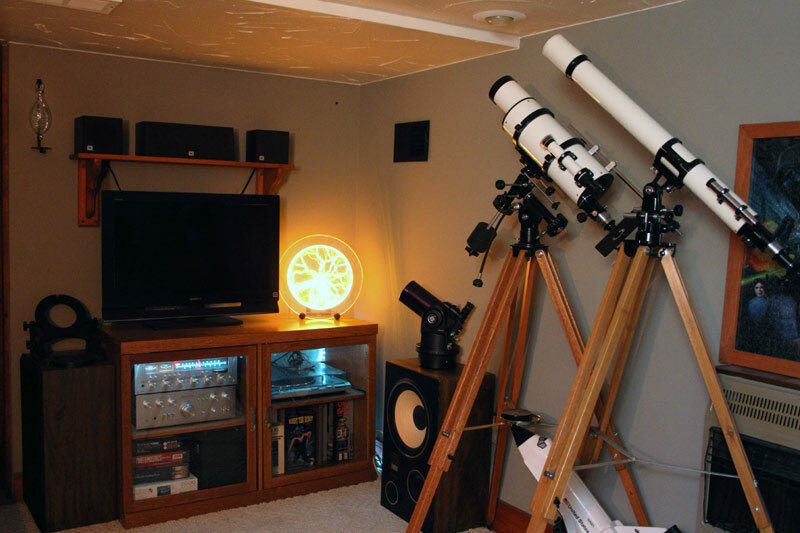 My new wife is OK with it there for now, but after we remodel it will probably get relegated to the man-cave. A single page from a large-format German world atlas, dated 1881. 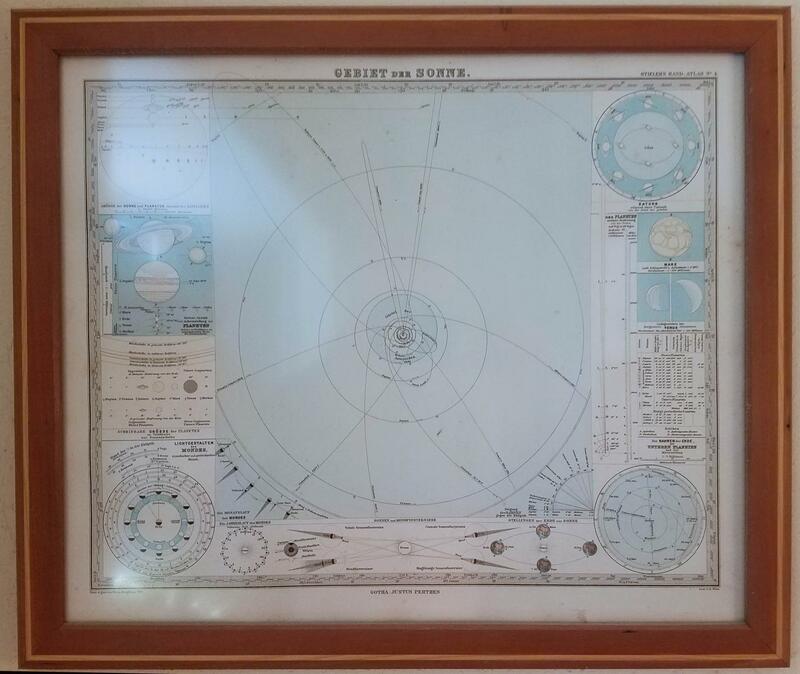 The atlas was being sold off page-by-page, an utter sin, but I was lucky enough to grab the sole astronomy page, depicting the solar system as it was known then. I made the frame, cherry with a pine inlay. It's roughly 16" x 20". 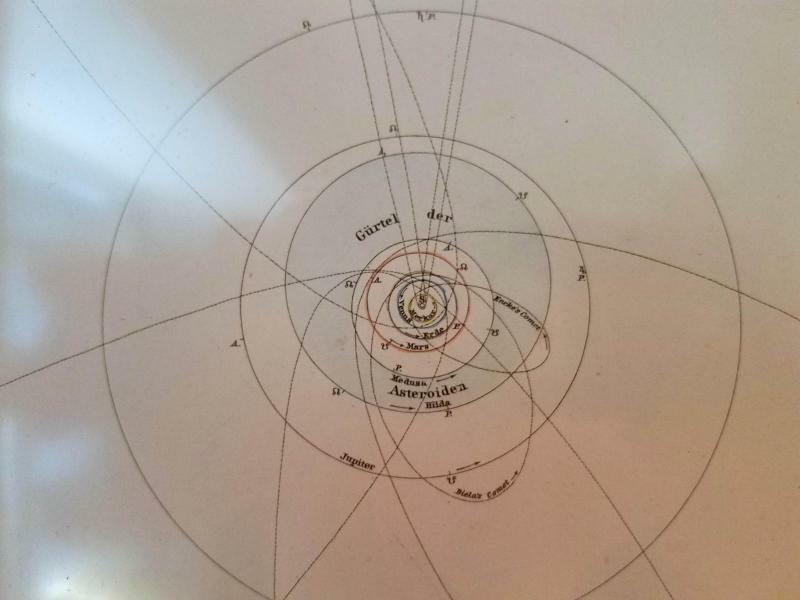 A close-up detail of the solar system. 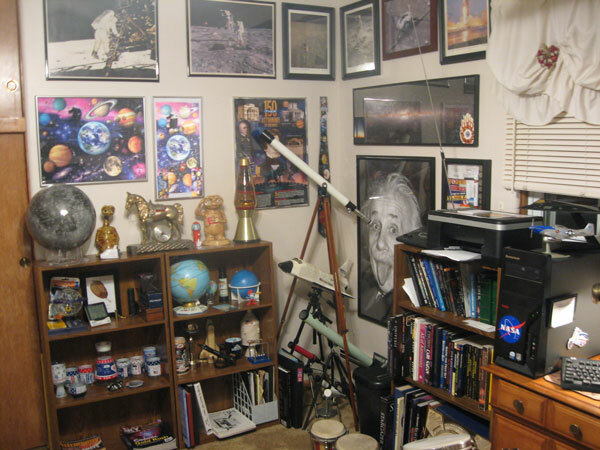 Thanks to folks who have posted in this thread, I'm getting ideas for a "Classic" astronomy/science/sci-fi themed display. Remembering stuff long stored or forgotten. 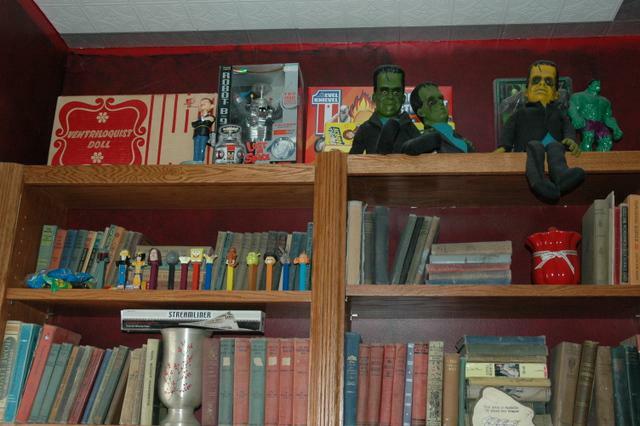 Besides Dr. Who, my mom was also a stamp collector. She sold much of her collection before she passed-away, but I did inherit some nice space-themed stamps and first-day covers. I'll go through those next. And I suppose it wouldn't be a crime to display a tardis or a talking dalek. Mom would approve of that. 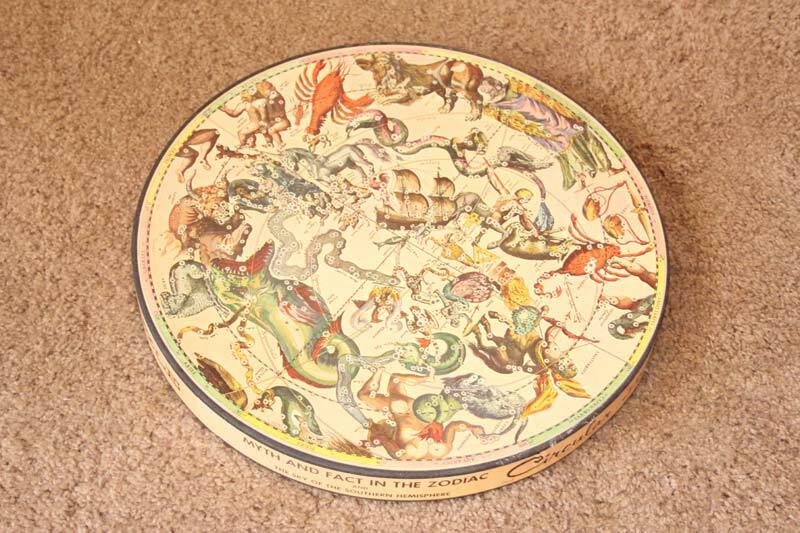 The 1965 Puzzle above is 20 1/4" diameter, so i`ll more than likely have custom to make one. Dave, do you glue the puzzles together when completed? Chuck, No! after completed i slide them onto a piece of cardboard, put another piece of cardboard on top then flip it over and just slide the puzzle into the frame. it original, and in my opinion, from ruining it. That's a great looking page. Parting out a rare old book is at least as bad parting out a rare old scope. Nice work on the frame. 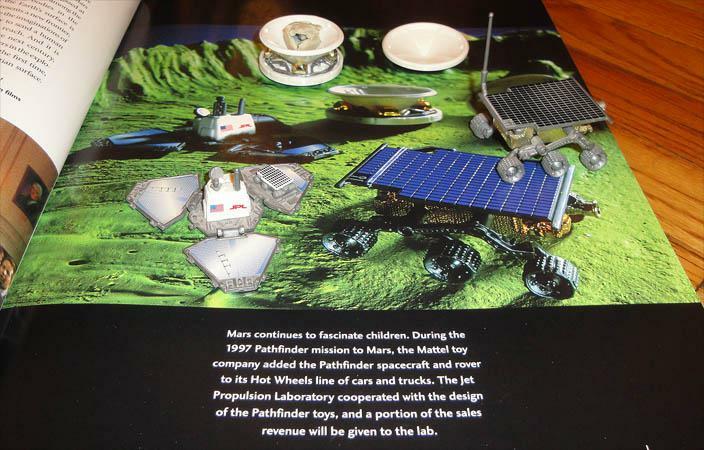 Hot Wheels JPL Sojourner Mars Rover, acquired during a visit to JPL in 2000, photographed on a page from "Uncovering the Secrets of the Red Planet" by Paul Raeburn and Matt Golombek, 1998.